Men who delay starting a family are more likely to have "geekier" sons, a study suggests. They were brighter, more focused and less bothered about fitting in - according to the "Geek Index" devised by King's College London. The mother's age had no impact, and daughters seemed to be immune. One scientist said a trend for delayed parenthood might mean we were heading towards a "society of geniuses" able to solve the world's problems. The findings are rare good news in the science of delayed fatherhood. Repeated studies have shown that older sperm is more prone to genetic errors and children are more likely to develop autism and schizophrenia. The researchers looked at test results from 15,000 twins taking part in a huge study tracking their development. Those with a high geek score, unsurprisingly, went on to do better at school - particularly in the fields of science, technology, engineering and mathematics. Dr Magdalena Janecka, from King's College London, told the BBC News website: "Paternal age should not be the main focus when we're thinking about risk, individual families should not influence their decisions on parenthood based on these findings." The gender differences are not fully explained. It could be the measure of geekiness failed to spot differences in how it emerged in boys and girls, the scientists said. Or it could be down to differences in the way the brains of the boys and girls developed. 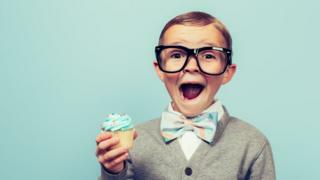 Prof Allan Pacey, from the University of Sheffield, said: "Whilst it may be chic to be a geek, I would not recommend that would-be parents delay their plans to start a family to specifically increase the odds of having a child with geek-like qualities. "The dangers of older parenting are well described, such as an increased risk of infertility, miscarriage, or conceiving a child with a variety of debilitating disorders. "However, I do find the idea of a 'geek gene' quite intriguing, and, given our recent trend to have our children later in life, perhaps we are destined for future society of geniuses that are going to help us solve all the world's problems." The research team also believe some genetic traits being inherited from older fathers could be affecting both geekiness and autism. Dr Janecka said: "When the child is born only with some of those genes, they may be more likely to succeed in school. "However, with a higher 'dose' of these genes, and when there are other contributing risk factors, they may end up with a higher predisposition for autism."